Cufflinks of the mysterious "Fleur-de-lys" maker, circa 1925. The Stamping Act of 1906 required that makers of gold and silver jewels in the United States mark their pieces with the purity of the precious metals. But it was not until 1961 that American jewelry manufacturers were required to sign their pieces with a maker's mark. 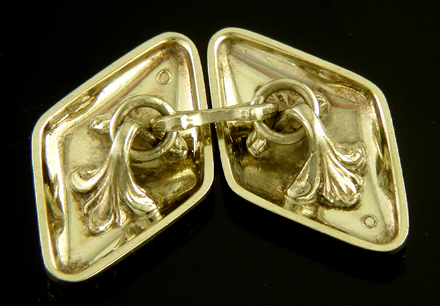 As a result, there is a body of fine cufflinks created in the first half of the 20th century that are unattributed. The anonymous makers of these beautiful cufflinks have been nicknamed the "Mystery Makers." Frequent readers of this blog are aware of my interest in the Mystery Makers. This month I feature several striking cufflinks from an unidentified cufflink maker who favored distinctive Fleur-de-lys brackets. 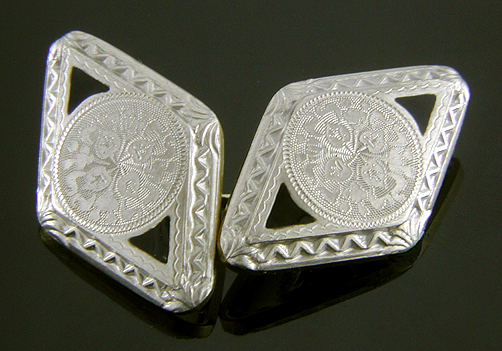 The aptly named "Fleur-de-Lys" maker created richly engraved platinum and gold cufflinks in the years around 1925. At the top of this note is a wonderful example with intricately engraved platinum centers flanked by black enamel accents and surrounded by bold zigzag borders. The Fleur-de-lys maker united jazzy, dramatic borders with intricately engraved centers in a pleasing fusion of Edwardian and Art Deco design. The bold borders beautifully balance the engraved designs and are an integral part of the overall design. All to often borders appear to have been added to cufflinks as an afterthought merely to relieve the plainness of an unfinished edge. The above Fleur-de-lys maker cufflinks have jazzy Art Deco borders and radiant engraved star burst centers that capture the excitement of the era. They would have been the perfect accessory for an elegant affair at Jay Gatsby's. In addition to dramatic borders and intricately engraved centers, the Fleur-de-lys maker favored unusual shapes. 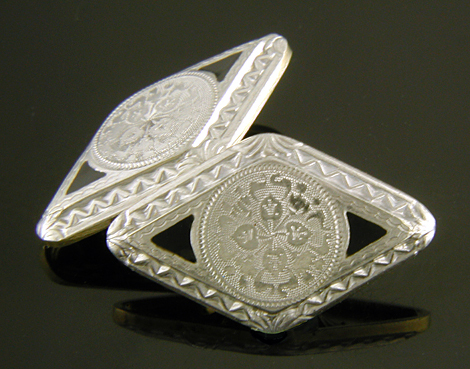 Traditionally cufflink makers favored soft, rounded shapes so a cuff could be easily dressed. The design dicta was to avoid obtruding edges and sharp corners that might catch while a cufflinks was being passed through a buttonhole. The most common cufflink profiles were circles, ovals and rectangles with the corners rounded or cut away. In contrast the Fleur-de-lys maker favored marquises, navettes and hydrid shapes with right angles and unsoftened corners. The unique cufflinks have elegantly jagged profiles that speak to the Art Deco fascination with technology, an embracing of the Machine Age. Given the striking beauty of the cufflinks, any difficulty slipping one through a recalcitrant buttonhole is well worth the effort. Reverse of Fleur-de-lys maker cufflinks. Several of the Mystery Makers are known by the distinctive linkages - brackets, bridges and cross bars - they employed. In earlier posts I have written about the Winged Bridge and Acanthus Bridge makers. The nickname "Fleur-de-lys maker" derives from the elegant, flowing brackets which help secure this maker's cufflinks on the cuff. The bases of the brackets are reminiscent of an iris in bloom. The Fleur-de-lys maker also utilized a distinctive crossbar marked "PLAT." and "14K" for the precious metals. may be followed to identity an unknown maker. Cufflinks of the mysterious Fleur-de-lys maker, circa 1925. Recent additions to the Antique Cufflink and the Estate Jewelry Galleries include: striking platinum and black enamel cufflinks from the Jazz Age, intricately engraved white gold cufflinks created by L. Fritschze & Company, a hypnotic pair of diamond-set cufflinks from Wordley, Allsopp & Bliss and an elegant onyx and pearl dress set. A radiant Art Nouveau brooch of Flora, Goddess of Spring, rounds out the new offerings. Black Tie Striking cufflinks that bespeak the exuberant elegance of the 1920s. Just right for "putting on the Ritz" at Jay Gatsby's next black tie affair. Created in platinum and 14kt gold, circa 1925. Intricately Engraved Elegant white gold cufflinks with intricately engraved radiant star bursts or flower heads. The dramatic centers are surrounded by geometric Art Deco borders. Crafted in 14kt gold, circa 1925. Mesmerizing Diamonds A hypnotic swirl of concentric circles set with a sparkling diamond. Dramatic black enamel borders complete the design. Created by Wordley, Allsopp & Bliss in 14kt gold, circa 1930. Onyx & Pearl Dress Set Dramatic black onyx centers surrounded by elegant white gold borders and set with small white pearls. The dramatic interplay of black and white captures the jazzy elegance of the 1920s. Crafted in 14kt gold, circa 1925. 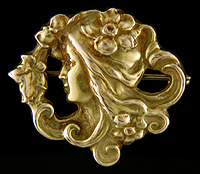 Goddess of Spring A beautifully rendered Art Nouveau brooch of Flora, the Goddess Spring. The Goddess's golden tresses are bestrewn with a bouquet of flowers and foliage. Crafted in 10kt gold, circa 1900.